Description: A former Reading/Conrail SW1001 sits beside an SD60. Title: NS 9152 with a s%&tload of coal. Est. 120cars. Description: NS 9152 with a s%&tload of coal. Est. 120cars. Title: NS 9152 crossing the diamond. Description: NS 9152 crossing the diamond. Description: NS Southbound Freight Train 131 at Irondale, Al. Description: An empty Herzog rock train, NS 922, heads east toward Columbus. Description: Won't see this mix very often! Description: A repainted NS SD60 shows off its new coat of paint while taking a spin on the turntable. 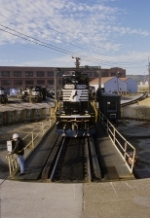 Description: A repainted NS SD60 gets spun on the turntable at the Juniata Locomotive Shop. Description: NS SD60 in "horse head" paint. Description: westbound pulling into the yard. Description: 61G heading out at Bessemer and only a mile from Burstall. Description: Seeing four of six locomotives leading the way around Horseshoe Curve. NS 3375, 3352, 9154, 3339. Description: NS 3375, 3352, 9154, 6586, 3339, 6628 lead the way at Horseshoe Curve in PA. Description: NS 3375, 3352, 9154, and 6586 rounding the curve. Description: 212 crosses the South Branch of the Raritan River (far bridge) and Cramer's Brook (near bridge), 0850 hours. Description: 212 crosses the South Branch of the Raritan River (far bridge) and Cramer's Brook (near bridge), 0849 hours. Description: 412 rolls through CPF679 at 8:02AM.